Carolyn Kramer Gallery founder and gallery director Carolyn Kramer answers quickly and cogently when she’s asked why she decided to assemble “Rebel with a Cause,” an exhibit of portraits by six artists that opens this Friday. It’s not just about speaking out or even marching. It’s about doing something that brings about change. When Kramer worked as a rep for models, she saw the sexual abuse that was going on — she was assaulted herself and threatened by a photographer — and years before #MeToo became a cri de coeur, she fought back. Now, as a gallery director, she’s fighting back with the means that are available to her: she’s creating a show, one that will get people crying, cheering, inspired to act. The paintings she commissioned are monumental in scope, most of them five feet tall and four feet wide. 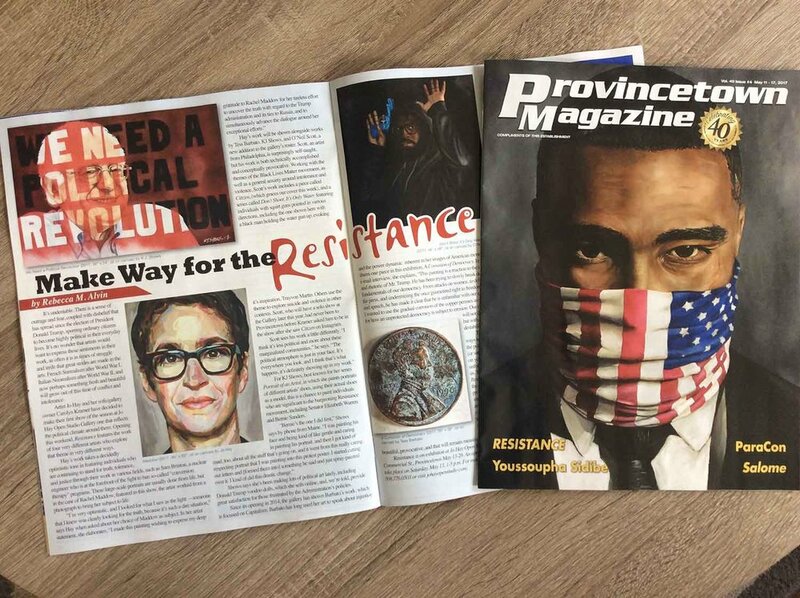 They’re portraits of people — specifically, people who have sparked protest or galvanized a movement. Jo Hay, Kramer’s life partner and the namesake of the gallery, is doing three portraits for the “Rebel” show: Linda Sarsour, Arab-American activist and co-chair of the 2017 Women’s March; Emma González, the stunningly articulate 18-year-old high-school student who survived the Parkland shooting; and “Notorious RBG,” a portrait of outspoken Supreme Court Justice Ruth Bader Ginsberg. Hay, too, was deeply affected by the Women’s March. “I want to make large paintings of women that young girls will see and say, ‘All right!’ I’ve seen paintings of old men in suits. I want to see big paintings of women doing big things,” she says. A key piece in the show is “Unbothered, a Portrait of Tarana Burke,” the African-American woman who started #MeToo and is largely unknown. It’s a painting by Michael Elsasser, a former Catholic seminarian who left the priesthood to tend to a friend with AIDS in the ’80s. In the years since, he and his husband have pioneered adoption by gay couples. Elsasser’s current calling is to paint people with whom he makes an empathic connection, because of how they’ve suffered or found redemption. Burke was one of those people. “Tarana supports young women and girls who have been abused and helps them try to reconnect with the joy in their life,” Elsasser says. Burke tells a story of how, because of her own experience with abuse, she was unable to tell a young girl who opened up to her “me, too,” and watched the girl clam up when confronted with another adult who was powerless to help. “Then Tarana goes on to develop #MeToo, and that’s why I wanted to paint her as a rebel hero,” Elsasser says. That humanitarian connection makes for powerful art. 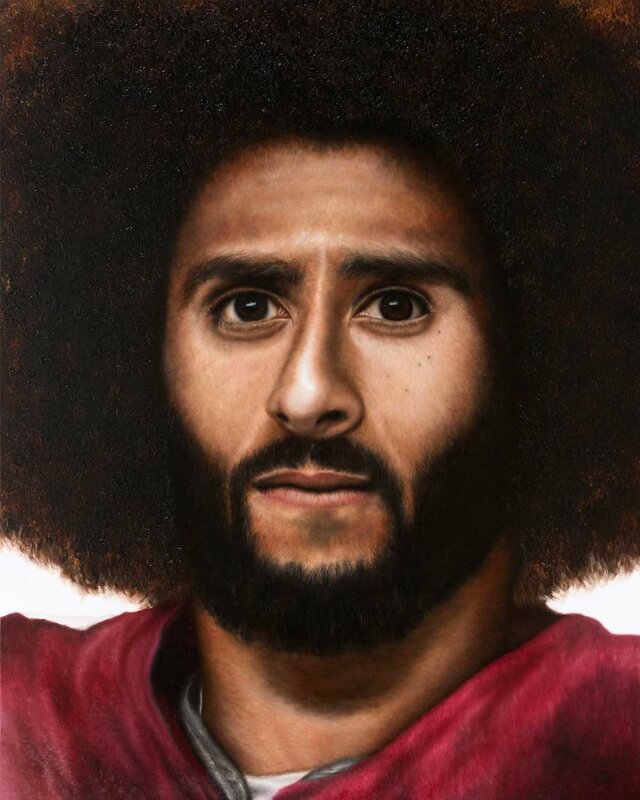 O’Neil Scott did a moving portrait of Colin Kaepernick, the NFL quarterback whose kneeling protest during the national anthem has left him unemployed, because Scott, as an African-American male and a former Division I athlete, deeply understands why the sacrifice was made. Another artist in the “Rebel” show, Cobi Moules, a trans man, documented his transition in drawings and oil self-portraits, but doesn’t consider himself political at all. “I found him online,” Kramer says. “I looked at his website, and I thought, my God, these portraits are so interesting! I wanted a painting that would represent gender equality issues.” Moules agreed to join the show, but was clear about not wanting to be labeled a rebel. 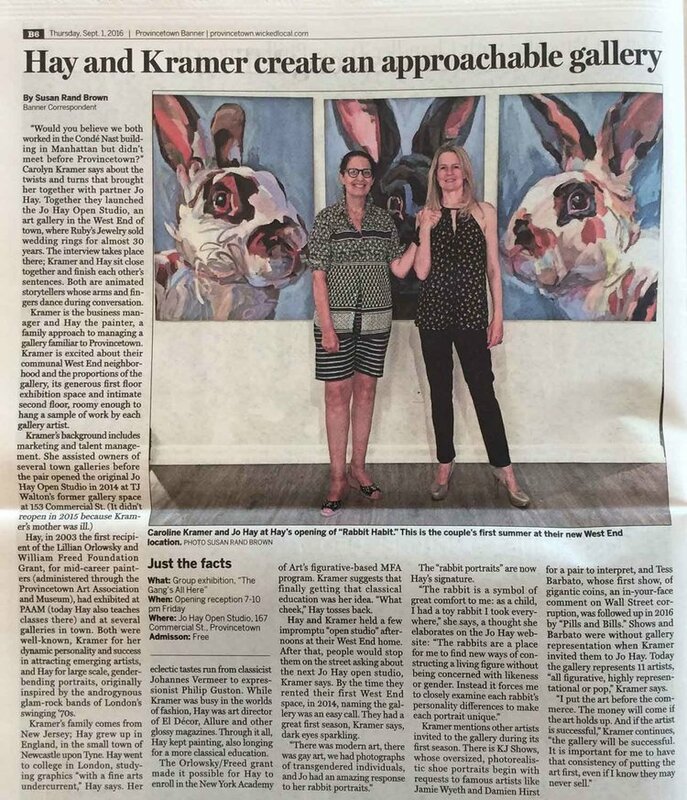 Artist Jo Hay and her wife/gallery owner Carolyn Kramer have decided to make their first show of the season at Carolyn Kramer Gallery one that reflects the political climate around them. Opening this weekend, Resistance features the work of four very different artists who explore that theme in very different ways.